Completely remodelling a bathroom can be a long drawn out process that people put off for years because they believe it will be a stressful and expensive project. Giving a bathroom a fresh and appealing new look, however, doesn’t necessary mean gutting it and starting from scratch. There are many ways you can add value and appeal to an existing bathroom without it costing the earth. Here are a few tips to achieving the look you want without breaking the budget. Adding new tiles to the floor and/or walls will make a huge difference. It’s a very easy way to modernize a bathroom, while keeping costs to a minimum – particularly if you can do the tiling yourself. Due to the size of the area you’ll be tiling and the fact that there will be mirrors, basins, showers and toilets to consider, the final area you need to tile becomes relatively smaller and therefore can be really cost effective. White tiles give the illusion that the room is larger (as do larger sized tiles), so if your aim is to try and create a roomier look then this is the option to consider. Reno King Paul Eslick always says Bigger-Brighter-Better for bathrooms. Gone are the days of the dingy bath behind the pretty patterned shower curtain. Installing a glass shower enclosure will make a bathroom feel bigger, modernize it - it will give a whole new feel to the bathroom. A glass shower screen will also be more effective at keeping the water in the bath and off the floor… water is incredibly damaging if left lying around and causes all sorts of issues. If you have added new tiles to the walls then a glass shower enclosure is the perfect complement to make the most of the renovation. If the bathroom has a bath tub installed and it isn’t in the best condition then look at refinishing it rather than replacing it. By refinishing the bath the scratches or discolouration will disappear and leave it looking as good as new. It also avoids the cost of replacing the tiling that will most likely be damaged when an old bath is removed. Depending on the colours of the bathroom, appropriate lighting and fixtures play an important role in a renovation. Not only does light set the mood for the room it can make the bathroom feel bigger or smaller. That is, if the bathroom is dark in colour, or there is little natural light, it would benefit from having bright lighting so it didn’t look so dark all the time. If a bathroom is predominately white then the lighting requirement won’t need to be so bright to create that Bigger-Brighter-Better and roomy look. Whilst these days stone and metal sinks are becoming more popular, in a rental property you really want a timeless, clean and classic look. A few small changes such as replacing the sink (if it needs it and the vanity is in acceptable condition) or replacing the whole vanity if the existing one is really outdated, discoloured or water damaged, or installing new tap fixtures can make the bathroom look as though it’s been entirely renovated. Now keeping in mind that every $1 spent is supposed to result in $3-$5 returned when you’re renovating an investment property, if you are having electrical work done and the property you are renovating lends itself to certain added touches (say, as an example, an executive rental), a towel warmer is a fantastic idea. They actually aren’t expensive and they’re sure to be appreciated by some tenants and noticed by those attending open inspections (for sale or rental). This would particularly apply to colder climate areas, although smelly, soggy towels are actually an issue in the tropical areas of the country as well! A new toilet seat can make the world of difference. Replace ones that are cracked, discoloured or scratched. By upgrading the toilet seat it will ensure that it doesn’t stand out for all the wrong reasons. All in all most people have similar expectations of bathrooms and kitchens. Tenants want that space to be clean, bright and spacious and to be inviting to friends, family and visitors. Any or all of these methods can be considered to give a bathroom area a big lift. They’re all very cost effective and relatively quick to achieve. 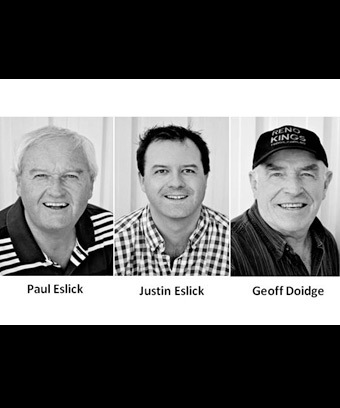 “From over 70yrs combined experience & $40million in property holdings, Reno Kings Paul Eslick, Justin Eslick & Geoff Doidge show you how to make money in property." The Reno Kings have been successful in property for over 35 years – and it hasn’t been by taking risks! And for 12 years now they’ve been showing people from all over Australia how to buy exceptional property deals, cleverly add tremendous value to residential properties through cosmetic renovation and development and to safely and successfully create wealth by building a property portfolio.